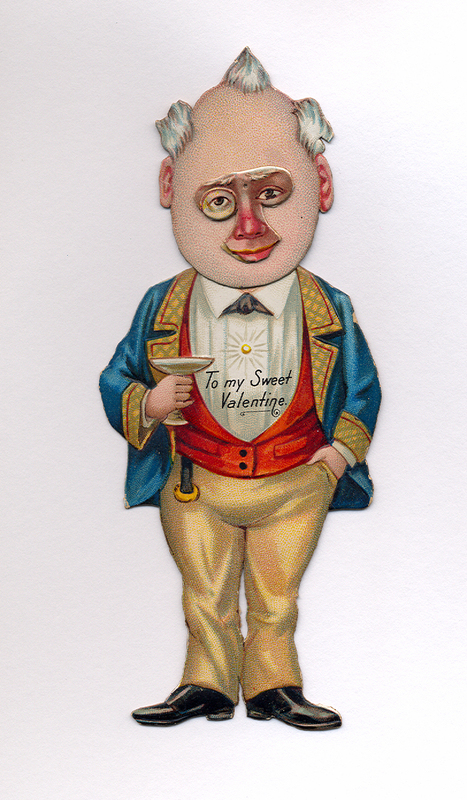 Here's another odd valentine from my collection. 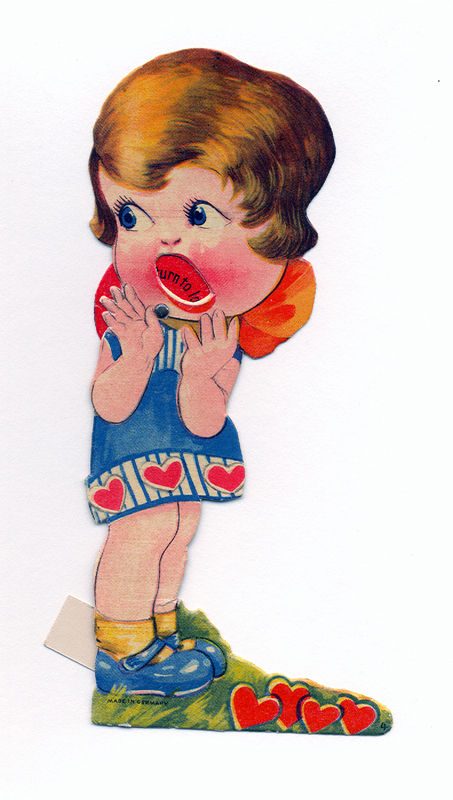 Made in Germany in the 1920s-30s, this mechanical valentine features a girl with a die-cut open mouth. As the wheel hidden in her bow is turned, words pass through her mouth, making it appear she is shouting them out. They read: "It's your turn to love me, valentine!" One of my favorite vintage toy lines is Mr. Potato Head, so it's probably not surprising that some of my favorite vintage valentines are those with similarly anthropomorphic characters. 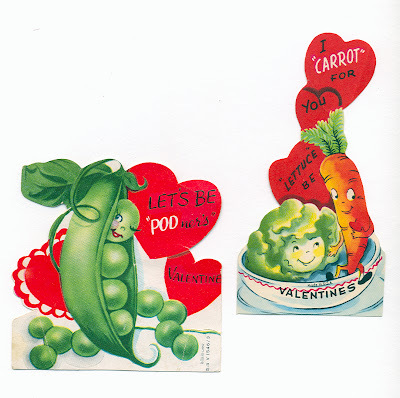 Here are my two most recent such finds, featuring friendly pea pod, lettuce, and carrot people. One of the loveliest valentine postcards in my collection is this one, mailed from Chicago in 1911. 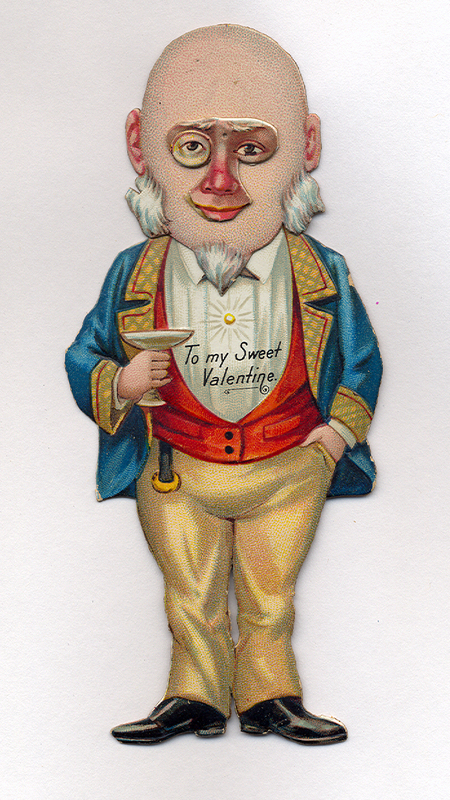 The richly illustrated card features a beautiful woman blowing heart-shaped bubbles for a group of chubby cherubs. 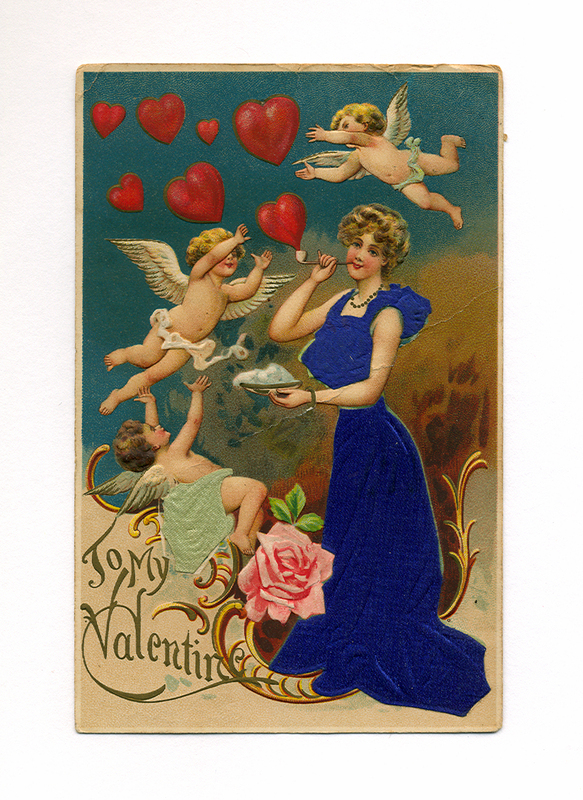 The woman's dress and one of the cherub's wraps are actually made of fabric, affixed to the card. 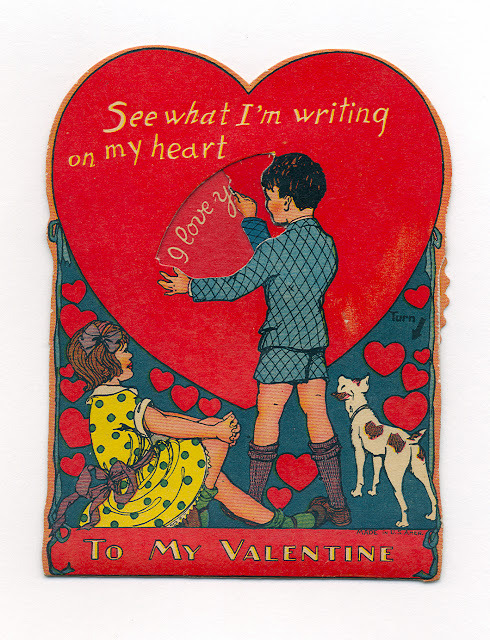 One of the most unusual valentine postcards I've found is this one, circa 1911. 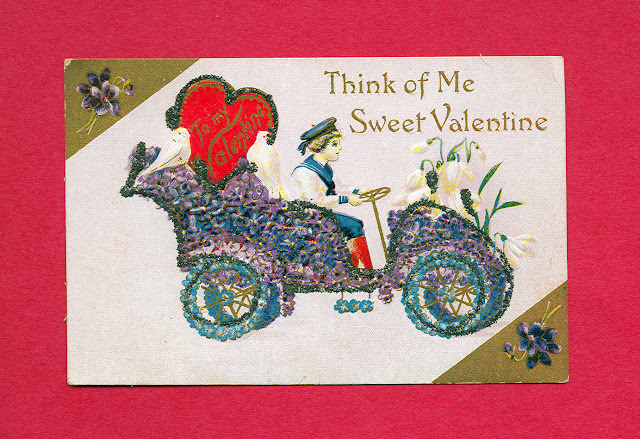 It features an antique automobile festooned with flowers done in raised relief and liberally sprinkled with mica glitter. A cute little sailor drives the flowermobile to its romantic destination. 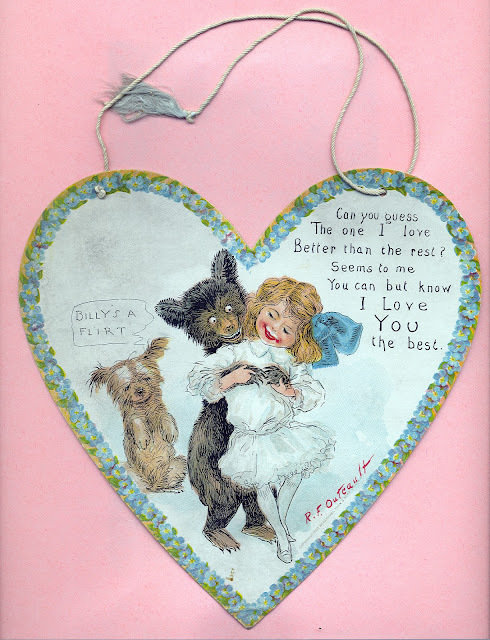 Some of the "Other Stuff" I collect, besides toys, is vintage valentines. The variety of valentines produced over the past 200 years is incredible; I'm always surprised at what I find. For the next seven days, I'll share some of my latest discoveries. First up: this mechanical card, circa the 1940s, which features a die cut "chalk board" window. As the wheel on the right is turned, the boy's arm moves across the window, appearing to write the words "I love you" on the board. Cleverly constructed, it's an ingenious little card.